As you may already know, Sarah Palin has been the Governor of Alaska and was the Republican nominee for Vice President in 208. She resigned from her position as Governor in 2009 and currently runs a political action committee and works as a news commentator for Fox News. 25. Based on what you know, would you say that Sarah Palin’s efforts since resigning as Governor in 2009 have made you more likely or less likely to support her if she runs for President? Do the math and you will see that since the half-term former Governor of Alaska quit her elected position in July of 2009, a whopping 58% of people are less likely to vote for her as President. This means that despite the fact that Palin has elevated her status as a celebrity via her Facebook and Twitter rantings, and has captured the throne as Queen of the Tea Party movement, she has actually decreased her own chances of a future electoral victory. In short, Sarah Palin has fudged it up again. Fudge it up. Too bad she couldn’t see it. Fudge it up. Now she can’t conceal it. Fudge it up. Now she has revealed it. Fudge it up. A wound but she can’t heal it. 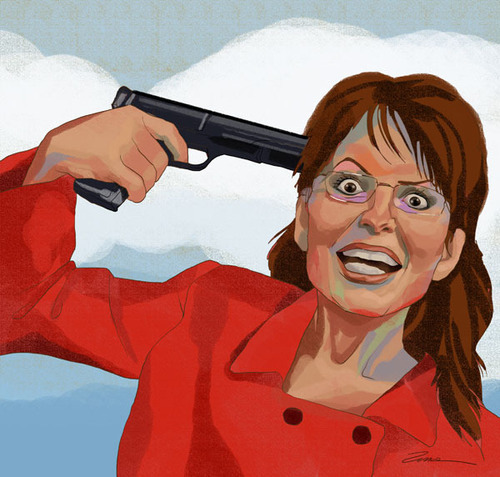 Posted on September 28, 2010, in Sarah Palin, Songs, Tea Party and tagged Facebook, palin, Politico, Sarah Palin, Songs, Tea Party, Tea-Baggers, Twitter. Bookmark the permalink. 13 Comments. Love it, BP. One of your best! and apparently booed last night on DWTS despite how bots and even the show is trying to spin it. Ah, gotta say, as much as I despise the woman, today’s ‘reload’ graphic is a bit much. Yeah, you are probably right. Sometimes even lil’ ole Lynnrockets gets carried away. Jimmy Kimmel’s opening segment last night had her “shooting” someone she didn’t agree with, with her fake smile plastered on her face. She’s the one using the “don’t retreat, reload” phrase whenever she wants. She should have never used such terminology/imagery against her “target” Democrats, but she’s used it repeatedly in her tweets, advice to candidates and on Facebook and Fox; now try getting that genie back in the bottle. Good work on the song, lynnrockets. You amaze me, as usual. “Good-bye Crazy Mommy, I’m Never Coming Back To Alaska”, sounds like a hit. I think you can add that 7% “no difference” segment into the total against her. Her behavior since her nomination has made no difference to me in voting for her for anything. It has always been 1000% NO WAY and it remains 1000% NO WAY today. In truth all the folks I talk to in rural SE IN think she is a nut case and should be home with her family instead of prancing around the country like a grifting carnival freak. “A grifting carnival freak”, gotta love it! After all her surgery to “fix” her face, she looks pretty damned freakish to me. Her shilling hatred and fear (lions, and tigers, and liberals OH MY!) is about up there with a carnival huckster scaring the locals or a revival preacher screwing his flock for their seed money. Hey Gindy, don’t sugar-coat it, tell it like it is!